As the 2018 IPCC Special Report makes clear, the need to advance mitigation and adaptation is now more urgent than ever before; moreover, integrating the two streams of action in research and practice via what we call “low carbon resilience” (LCR) policy, planning, and development approaches is potentially more efficient and effective than the current, largely siloed approach. Climate changes such as intense heat and increased flood, and some of the potential adaptation responses to them, can significantly reduce the effectiveness of emissions reduction planning if not taken into account. Likewise, clean energy, renewables infrastructure, and land/water use planning designed to reduce emissions all have potential to contribute to or hinder the success of adaptation actions. Ensuring both climate action approaches are supported is important; integrating them through LCR approaches can reduce administrative and financial burdens and improve effectiveness, yielding multiple co-benefits, expanding access to funding and finance sources, increasing return on investment in adaptation, mitigation and infrastructure, and accelerating implementation of both mitigation and adaptation. In short, applying LCR as a lens on all planning and decision-making for all orders of government, professions, the private sector, and civil society organizations has the potential to increase opportunities to achieve transformative, systemic change. LCR Case Studies (a green infrastructure project, a building design and a municipal climate action plan). Details of a forthcoming LCR Resource Database is provided on page 58 and Professional's feedback on this work is available from page 60 of the full text. *Download the full text from the right-hand column. Find a summary of key sections from the report below. This briefing note (from page 14 of the full text) introduces the concept of low carbon resilience (LCR), or integration of climate change adaptation and emissions reduction, and outlines advantages and co-benefits that can be gained by adopting the LCR approach. It is intended to encourage individuals and organizations to begin thinking about how climate change mitigation and adaptation can be integrated in planning and action. Key Message: All levels of government in Canada need to embed low carbon resilience in policies and strategies to increase efficiency, achieve co-benefits, and reduce the economic, social and ecological risks associated with the current siloed approach to climate action. Governments can aid implementation of LCR by supporting development of pilot projects, as well as education and resources for students, professionals and communities. Conclusion: Climate action plans at all levels of governance must evolve rapidly if Canada is to successfully respond to the need to both reduce emissions and build resilience to climate change impacts. LCR approaches can help drive this progress and avoid risks while achieving multiple co-benefits. The LCR Conceptual Process Model (from page 19 of the full text) outlines how key steps in climate adaptation and mitigation planning processes might be aligned to achieve integrated action. The following LCR Diagram further provides a high-level overview and further considerations related to integrating climate change adaptation and mitigation into planning processes. It is important to note that not only are climate adaptation and mitigation generally considered separately in professional and community contexts, but that climate action overall is still conceived of as separate from business-as-usual strategy, management, and operations. This work illustrates that integrated climate action – LCR – can and should be mainstreamed into all professional and governance policy and planning processes, and that this can be done at any stage of existing mitigation and adaptation plans. This case study (from page 25 of the full text) illustrates how low carbon resilience (LCR) may be incorporated into existing planning processes such as Official Community Plans and Comprehensive Community Plans and demonstrates that synergies and co-benefits associated with coordinating emissions reduction and adaptation can be achieved at the community planning scale. Communities require integrative frameworks that can assist them in developing LCR policies. This scan of the OCP and CCP processes pulls together resources and components from existing tools and case studies to start to explore how LCR might be adopted into community plans and strategies. The examples used are existing policies in OCPs or CCPs that reflect plans either focused separately on mitigation and adaptation, or that use an integrated approach. They represent mandated and/or recommended considerations for particular developments within particular host communities. Co-Benefits Potential of LCR: Application of the LCR model to OCP and CCP components such as Development Permit Areas and Evironmentaly Sensitive Areas has the potential to produce a number of co-benefits. For instance, greater attention to soft-infrastructure adaptation approaches in the foreshore, wetlands, or as street shading in communities, not only minimizes emissions associated with infrastructure development and extreme weather impacts, but also increases biodiversity habitat and survival, improves human health, increases property values, and streamlines financial and human capital costs. This case study (from page 31 of the full text) illustrates how low carbon resilience (LCR) might be incorporated into an existing tool, the Britich Columbia (BC) Energy Step Code. It demonstrates that synergies and trade-offs between reducing emissions and building resilience can be achieved at the building scale, and highlights how practitioners using the code might increase efficiency and effectiveness by considering future climate in building design and operation. Climate change has already altered temperature and precipitation patterns in BC and these trends are expected to intensify in coming decades. Buildings must be designed with BC’s current and future climate in mind if they are to meet energy efficiency goals. The Energy Step Code is an important advance in the Government of British Columbia’s strategy to reduce greenhouse gas emissions; however, it does not currently incorporate projected climate impacts. Taking an LCR approach by considering climate change adaptation and emission reduction in a single integrated process could improve the future performance of buildings being planned and assessed using the Energy Step Code. Next Steps: Practitioners and policy-makers adopting the BC Energy Step Code are making an important commitment to climate action by ensuring buildings are designed and constructed to increase energy efficiency and decrease emissions. However, it is also important to consider future climate conditions over building lifetimes. Taking an LCR approach to the Energy Step Code would allow emission reduction and climate adaptation goals to be integrated into a single decision-making process that ensures buildings continue to be energy efficient as the climate changes. 1. Green Infrastructure LCR Case Study: North Vancouver Rain Gardens: This case study provides an example of a municipal-level ecosystem-based approach to sustainable land and water use that demonstrates LCR benefits. 2. Building LCR Case Study: Christus Spohn Hospital, Corpus Christi, Texas: This case study provides an example of an LCR-based approach to building design and development. 3. Municipal Climate Planning LCR Case Study: City of Hamburg: This case study provides an example of an LCR-based approach to local government climate action planning. See page 37 (and onwards) of the full text for more detail on these case studies. 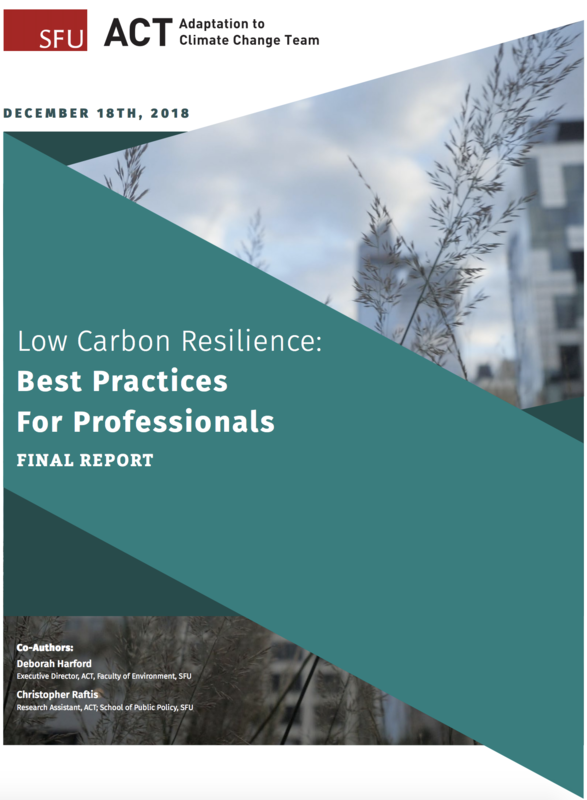 From page 54 of the full text: Continuing professional development (CPD) repeatedly emerged as a potential option for advancing low carbon resilience (LCR) practices during this project’s engagement of professionals and professional associations. Where appropriate, the two streams (mitigation and adaptation) of action can be planned and implemented through an integrated approach, referred to in this report and elsewhere as low carbon resilience (LCR). At its highest level, LCR is a lens that can be used to embed adaptation and mitigation at all levels of governance, planning, research, and practice. Mainstreaming LCR approaches can enable resource efficiencies while driving transformative solutions for a variety of sectors, from transportation to urban planning to agricultural operations. Working to connect, align, and integrate the skills, tools, and funding currently used to advance adaptation and mitigation separately has the potential to drive more effective results using fewer resources than the current siloed approach. Practitioners across professions have a key role as change agents in advancing LCR practices in all aspects of society. During this project, professionals clearly indicated that they require case study examples of how LCR can be achieved, and concise, accessible information and tools that can be easily shared to build understanding and support for LCR. Professionals also repeatedly referenced the need for interdisciplinary forums, processes and resources that can help advance cross-sectoral, collaborative understanding and implementation of ways to achieve LCR.